There’s always an occasion to buy someone you love a great golf gift. Whether it’s for an anniversary, birthday, retirement, or just to show someone you care about them, giving or receiving a golf gift is one of the best feelings a golfer can experience. With so many different products that can make affordable gifts, the task of finding the perfect men’s or women’s golf gift can be difficult. With this comprehensive list, you will be able to get up-to-date info on the most popular golf gifts in the world, and make a purchase that your recipient is sure to love. What type of handicap does your recipient play to? Do they leave subtle hints about their favorite golf balls, clubs, and other accessories? Once you have these questions answered, your shopping experience will be much easier. Treat your favorite golfer with a dozen (or two) of the most popular golf balls in the world! 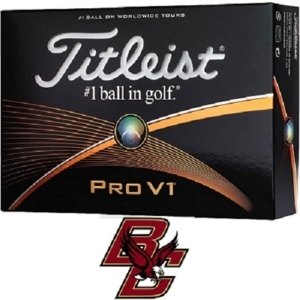 These golf balls are perfect for the golfer who supports their favorite college team(s) or alma mater. Provides great distance with amazing spin and control. Several popular NCAA school logos. Prior generations are not as advanced as the current models. Some NCAA schools are not available. The #1 Putting Training in Aid in Golf makes an amazing golf gift for men or women. This training aid is designed specifically for players who want to improve the speed and accuracy of 4-foot putts. 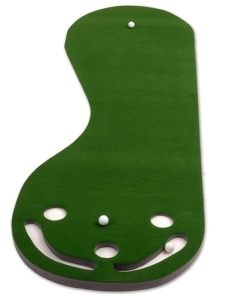 It can be used on the putting green or office, and will help you make more short putts! An affordable gift which fits the budget of most golfers. Easily fits in a gift bag. Not recommended for golfers who don’t practice much. Can be a frustrating training aid for beginner golfers. Giving the gift of a better putting stroke is made easier with the best putting mat in the industry. With the Putt-A-Bout Putting Green, you can get a feel for the true pace of the green from the comfort of your own home. Perfect for the home or office use. Sand trap sections in back catch missed putts. Smooth surface keeps your ball rolling true. Doesn’t roll up, making it tough to disguise as a gift. 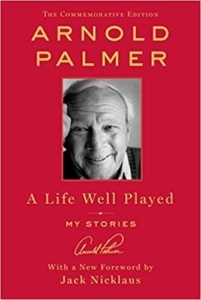 If your gift recipient loves Arnold Palmer, this amazing book is one they will surely love and appreciate. Filled with various anecdotes regarding one of golf’s most memorable legends, this book will certainly be a favorite of your favorite golf fan. Foreward written by Jack Nicklaus. Provides an in-depth look into Arnold’s life and career. Easy-to-read and ideal for bathroom reading. May not appeal to a younger audience. This golf gift takes a humorous side to golf accessories, yet is an effective storage bag for a couple golf balls, golf tees and ball markers. 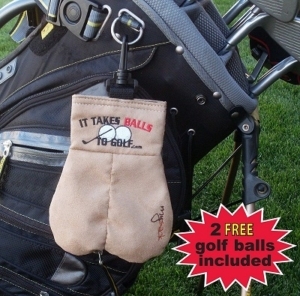 Aside from the unique design, this novelty golf gift is sure to delight someone with a sense of humor. Solid Velcro closure keeps your belongings secure. Clips perfectly to the outside of most golf bags. Not an ideal gift for women. Could be offensive to some recipients. 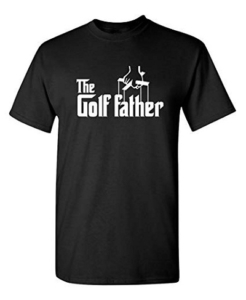 Based on the classic mafia film, this novelty golf shirt is great for your dad, husband, brother, or anyone else who loves golf and loves The Godfather. Made from pre-shrunk cotton, these t-shirts are incredibly comfortable and will put a smile on your favorite male golfer. Darker colors can be too hot in the summer. Not suitable to wear at most golf courses. Enjoy the convenience of all the yardages you need with a watch from one of golf’s leading GPS manufacturers. 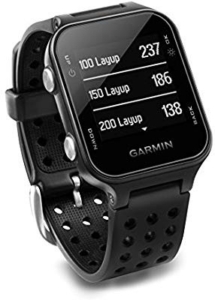 Featuring a variety of different distance measurements, plus stat tracking and activity tracking, this is a watch you’ll never want to take off. Promotes faster play without the hassle of using a rangefinder. Comfortable to wear as a fitness watch off the golf course. Swing-sensor compatible which provides data for swing improvement. Only available in 4 colors. Not as accurate as a laser rangefinder. One of the most comprehensive and well-engineered practice putting mats, MESIXI is a great gift for golfers of all ages and skill levels. Whether you make a putt or miss a putt, the ball comes back to you! Provides two different putting surfaces for fast and slower greens. 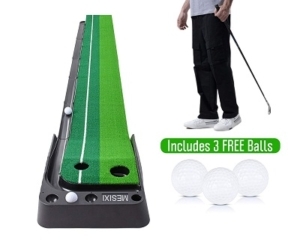 Three golf balls come with the putting matt. Smaller hole sizes help you hone in your stroke. Requires some assembly for return mechanism. Training holes may not work well for beginners. Show your support for your favorite NFL Football team with one of these amazing golf towels. You can keep your clubs and golf ball clean and your grips try while still showing off the logo of your team. Checkered design makes it easy to clean the dirtiest grooves. All 32 NFL Teams are available. Swivel clip makes it easy to attach to your golf bag. Not ideal for taking to and from your golf bag. Bottom embroidery susceptible to dirt. 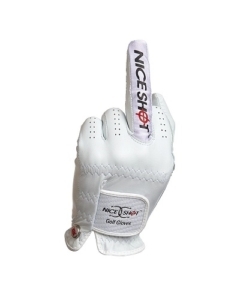 A quality golf accessory with a humorous design, golfers who love to show their silly side will love having this golf glove as a gift. Made from the same materials as name-brand golf gloves, this glove will provide a secure grip to any golf glove. Perfect for the golfer with a dry sense of humor. Available for both left- and right-handed golfers. Could be considered offensive to some golfers. 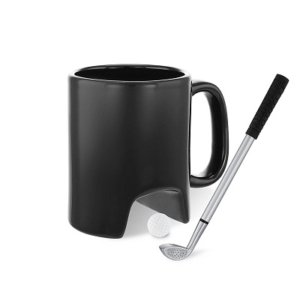 Practice your stroke and show off your love of the game at the office with this unique coffee mug gift set. The club-shaped pen can be used to hit the mini golf ball through the trough, giving you a way to kill time during boring meetings and conference calls. Golf club pen can be used for work. Holds 11 ounces of hot liquid. Gives kids something fun to play with when they visit the office. Mini golf ball is easy to lose. 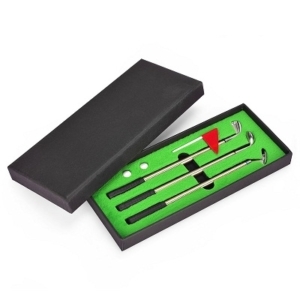 This 3-pen set is the perfect golf gift for your office’s Secret Santa exchange. The pen holder also acts as a putting green, providing a fun procrastination tool for those lull times at work. Each pen writes well and can be used for any writing task. The pens are refillable with a variety of different inks. The rubber grips protect the ball point, ensuring a long shelf life. Pens are not as effective as the standard office pen. Can be seen as a distraction in certain office environments. Golfers who love bottled craft beer will love this bottle opener. 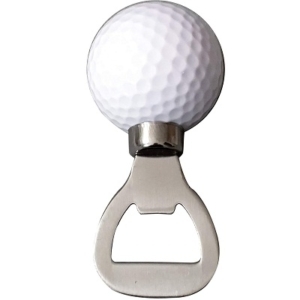 The golf ball is real and acts as a handle, proving a comfortable tool to open your beers. This bottle opener is as unique as it is reliable, and a great gift or stocking stuffer. Easily opens most capped beer bottles. Sturdy and can easily fit in a golf bag or pouch. Unique design tailored to golf fanatics. Does not have a magnet for storage on a refrigerator. Can be difficult to leverage with the golf ball handle. Know a golfer who could a more organized garage? 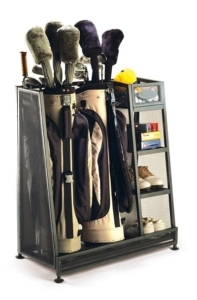 This organizer rack features enough room for 2 golf bags, 2 pairs of golf shoes, plus other accessories and golf balls. Give the gift of extra space and a convenient place to keep your clubs with this rack. Adjustable feet makes it easier to keep stable. Metal construction makes it sturdy and durable for years of use. Ideal for an office or basement as well. May not fit all golf bags. Assembly required, which may not appeal to some golfers. If you have a friend or relative who loves using novelty golf tees, these plastic bikini lady golf tees will certainly catch their attention. With enough height to tee up your driver, you and your golf buddies will get a kick out of these golf tees. Easy to place in the ground and holds the golf ball. Plastic material improves its durability. Not suitable for irons or fairway woods. Could scratch the bottom of your driver. 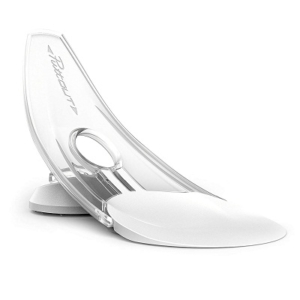 No longer will you have to buy new clubs anytime the grooves get worn with this groove sharpener. 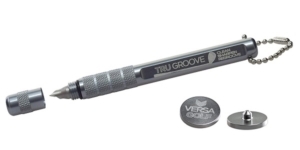 Whether you have U-shaped or V-shaped grooves, this tool can help your clubs last longer without affecting performance. Attaches easily to your golf bag. Comfortable handle makes it easy to use. Could cause damage to your clubs. Not suitable for use on fairway woods or drivers. 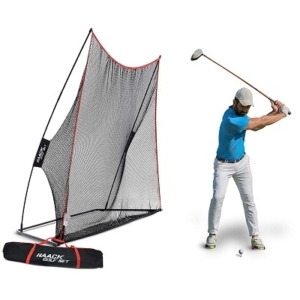 Enjoy the experience of practicing your golf swing in the comfort of your backyard or garage with this amazing golf practice net. Not only can you work on your full swing with this net, the red chipping baskets allow you to work on your chipping as well. Safe for both indoor and outdoor use. Safely returns the golf ball back to you. Target in center improves accuracy. Requires enough space in garage or backyard. Works best with a hitting mat, which is not included. 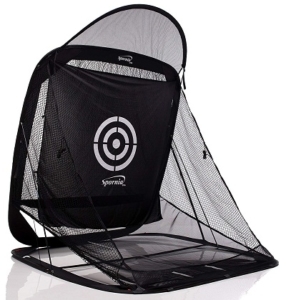 Ideal for indoor or outdoor use, this golf practice net makes it easy to hone your swing without a trip to the driving range. With its wide net, you can hit any club in your bag with confidence, and it makes the perfect gift for someone who loves to practice. Easy to setup and take down. Includes a carrying case for easy storage. Lifetime Warranty ensures you will get tons of use. Doesn’t include any chipping aids. Requires a golf mat for best use. Get the most out of your tee shots with these innovative golf tees. Made out of plastic instead of the traditional wood, these golf tees are designed to last longer and are far less likely to break, which will save you money over the long run. Makes the ideal stocking stuffer. Thin tip makes it easy to place into the ground. Available in different lengths for any club. 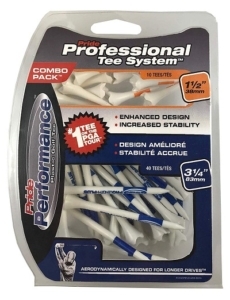 One of the most popular golf tees for professionals. When they get bent, they are no longer useable. More expensive than traditional tees. 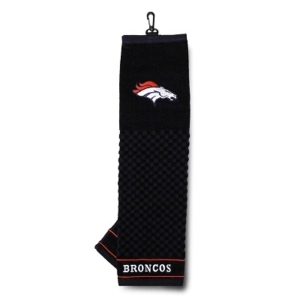 This headcover makes the perfect gift for the golfer in your life who is just as passionate about football. 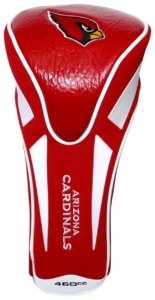 Designed for clubheads up to 460cc, you can show your love for your favorite NFL team while keeping your driver safe. Available for every NFL team. Displays logo prominently in two different places. Stretches at the entry for a snug fit. May be tough to remove and replace on some drivers. Not suitable for fairway woods or hybrids. If you know a golfer who loves to study everything about the golf swing, this book is the perfect edition to their golf library. Combining the expertise of a top 100 teacher and a biomechanics expert, this book makes a great gift for the avid golf reader in your life. 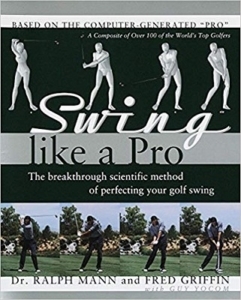 Provides in-depth info on the physics of the golf swing. Applies biomechanic wisdom to enhance golf swing knowledge. Analyzes the best swings of current and modern golfers and compares their similarities. Info can be a little overwhelming to the beginner golfer. Some golfers may not find it useful.